Season 4 is when Parks and Recreation really hits it’s stride. It feels like a show confident with what it is, fleshing out characters further and developing a few stories that you can really get invested in. Best of all, it is as funny as it has ever been. It feels like Parks and Rec always works best when it has a thread pulling all the episodes together. This usually involves Amy Poehler’s Leslie Knope and Season 4 is no different, this time seeing her run for political office. This kind of story means that there is plenty of chance for different kinds of situations, all within the sphere of local government, from an end of the world cult to sabotaging a model U.N and through to some questionable campaign ads. This is different style of story for Parks and Recreation and they take to it very successfully. As they have done with very new season, they develop the characters even further. Aziz Ansari’s Tom Haverford starts a failing company, April and Andy (Aubrey Plaza and Chris Pratt respectively) move in with the increasingly funny Adam Scott who plays Ben. This is the season when he shines and starts to become an MVP of the show. It is also the season when supporting characters begin to get their own stories and fleshed-out characters. As with sister show The Office, characters like Jim O’Heir’s Jerry or Retta’s Donna Meagle take a more important and central role, getting backstories and plot-points of their own. Add to this cast of characters some great cameos as well. There always feel like a host of recognisable faces, like Will and Grace’s Sean Hayes for example, enter Parks and Recreation but Paul Rudd as Leslie’s political opponent Bobby Newport is a casting coup. His stupidity and simplicity, particularly in episodes like The Debate, are some of the best moments of the series. It is still Nick Offerman’s Ron Swanson who steals the show though. From his take on the scouts (the excellent Pawnee Rangers) to his excitement over an impromptu treasure hunt, Offerman’s Swanson is the best character in the series, still offering great quotable lines and some of the funniest moments of the season. As always, his now customary episode featuring his ex-wife is the best yet, introducing a new “Tammy” to contend with. Regardless of the cast, Park and Recreation’s biggest strength is the great stories and the absurd situations the cast find themselves in. There are plenty of amazing episodes here, each with stand-out moments. Season 4 is most definitely a show at it’s height of power and popularity. The confidence the season shows is notable with each hilarious moment and there is definitely at least one an episode. 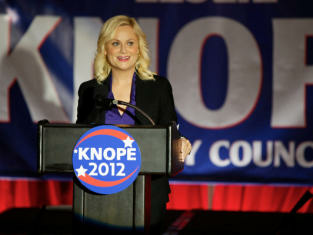 Overall, Parks and Recreation’s fourth season is the best yet. The storyline linking the season together is a unique one which offers a lot of great opportunities for storylines and hilarious moments. In the hands of cast members like Aziz Ansari and Amy Poehler this is put to great effect and made even better with offerings from characters like Nick Offerman’s Ron Swanson. Best Episode – Ron and Tammys: These event episodes are fast becoming the best of the season. Should there be another season? – Definitely. Season 4 is Parks and Recreation at it’s best.